PRP is used to regenerate the skin (superficial and deeper layers), using your own blood plasma that has been enriched. 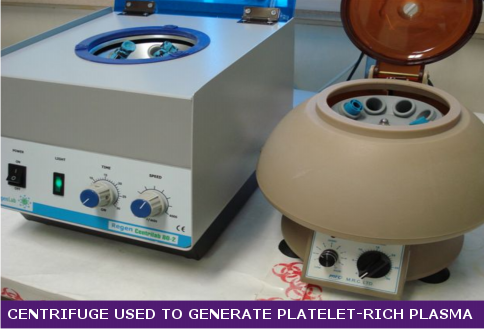 Platelet rich plasma can easily be separated from the patient’s own blood through a process of centrifuge. Platelets release growth factors that assist the human body to repair itself by stimulating cells to regenerate new tissue. Using your own enriched plasma permits the body to heal faster and more efficiently. The blood is collected in special sterile tubes and centrifuged in the practitioner’s rooms to separate the plasma. A topical cream anaesthetic is given to the area. The PRP is injected, by multiple tiny punctures under the skin. The main targets of aging and wrinkles are the forehead, area around the eyes, cheeks, chin and back of the hands. The process is relatively painless providing sufficient topical anaesthesia is applied. The process takes about an hour, is done in the practitioner’s rooms and the down time is minimal. Results are visible at 3 weeks, and improve gradually over the ensuing months, with improvement in texture and tone. Further treatments can be performed at 6-12 monthly intervals if the client desires this. This procedure is done by Dr Nardus le Grange in the clinic.